The "Hofbräuhaus München" is a typical bavarian pub with a century-old tradition. 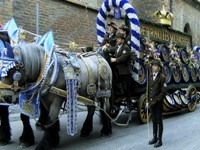 Existing since 1589, it is famous not only for its special bavarian "Hofbräu" beer, but also for its close connection with bavarian folk music and traditional bavarian dance shows. The folklore dinnershow evenings at the Hofbräuhaus pub give you the chance to discover traditional bavarian folklore performances and to be immerged into bavarian folk art at its best. While enjoying an abundant buffet and traditional Hofbräu beer, you will listen to polka and yodel melodies from Bavaria and Austria and see Schuhplattler dance shows and Alphorn players from Munich. At the end of the evening, you may try the Schuhplattler dance yourselves and sing famous melodies together with the folklore dinnershow artists.